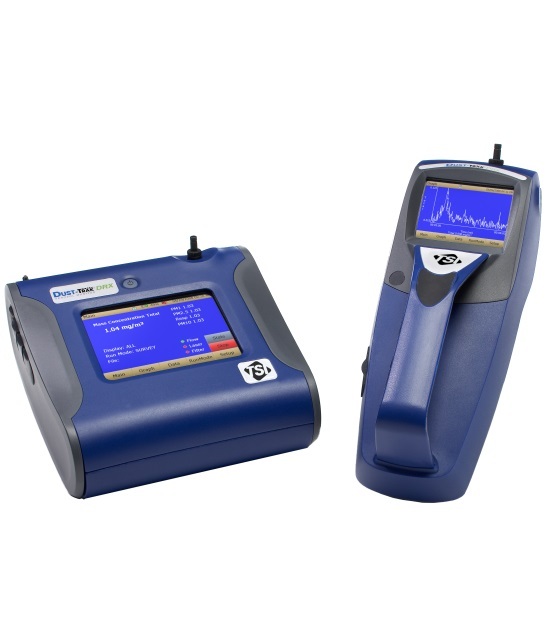 The TSI 8530, 8532, 8533 & 8534 DustTrak II & DRX Aerosol Monitors are battery-operated, data-logging, light-scattering laser photometers that provide real-time mass concentration readings for aerosol contaminants such as dust, smoke, fumes and mist. These instruments use a sheath air system that isolates the aerosol in the optics chamber to keep the optics clean for improved reliability and low maintenance. 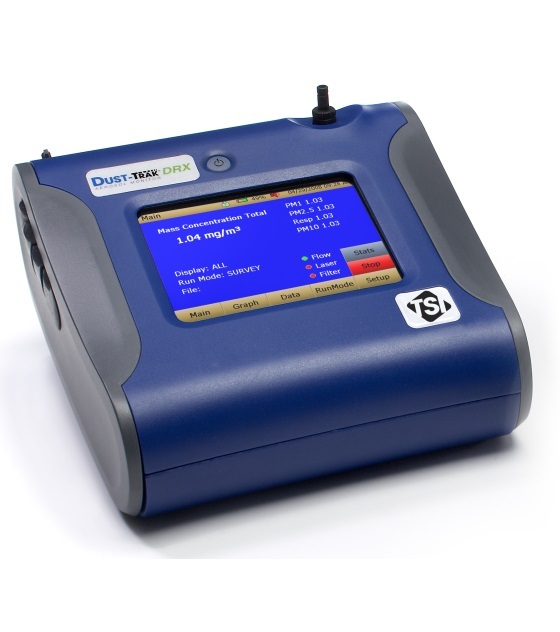 From desktop and desktop with external pump models to handheld models, the DustTrak II and DustTrak DRX offer a suitable solution for harsh industrial workplaces, construction and environmental clean-up sites, as well as clean office settings, with the DRX models being the only laser photometers on the market that can measure mass and size fraction simultaneously. Also, a choice of two environmental enclosure accessories are available to allow for protection of the desktop models to permit 24/7 outdoor monitoring regardless of the weather conditions and in harsh industrial environments. The new graphical user interface with color touch-screen puts everything at your fingertips. The easy-to-read display shows real-time mass concentration and graphical data as well as other statistical information along with instrument pump, laser and flow status, and much more. Perform quick walk-through surveys or program the instrument's advanced logging modes for long-term sampling investigations. Program the start time, total sampling time, logging intervals, alarm setpoints and many other parameters. You can even set up the instrument for continuous unattended operation. TrakPro™ Software Makes Monitoring Easier than Ever - TrakPro™ Data Analysis Software allows you to set up and program directly from a PC. It even features the ability for remote programming and data acquisition from your PC via wireless (922 MHz or 2.4 GHz) communications or over an Ethernet network. As always, you can print graphs, raw data tables, and statistical and comprehensive reports for recordkeeping purposes. 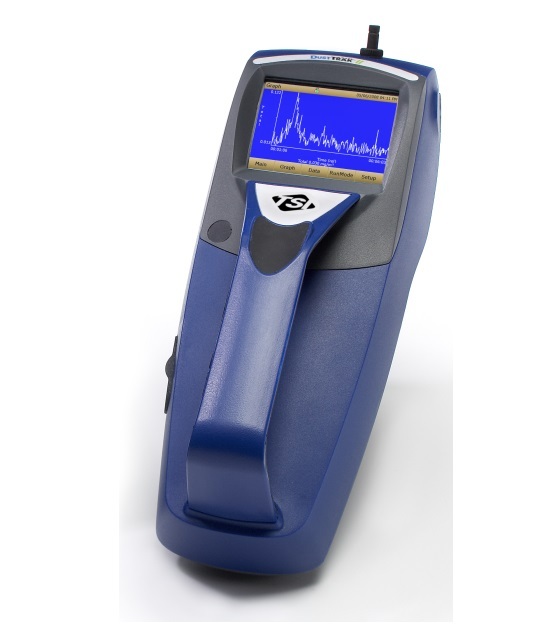 Perfect for Walk-Through Surveys and Single-Point Data Collection Applications - Handheld DustTrak aerosol monitors (Models 8532 and 8534) are lightweight and portable. They are perfect for industrial hygiene surveys, point source location monitoring, indoor air quality investigations, engineering control evaluations / validation, and for baseline trending and screening. Like desktop models, they have manual and programmable data logging functions. They also have single-point data logging capability useful for industrial hygiene walk-through surveys and indoor air quality investigations. Ideal for Long-Term Surveys and Remote Monitoring Applications - The DustTrak is also offered as a standard desktop (Models 8530 and 8533), as well as desktop with external pump (Models 8530EP and 8533EP.) All models have manual and programmable data logging functions, making them ideal for unattended applications. The standard desktop model is most suitable for indoor, continuous monitoring, while the desktop with external pump is designed for 24/7 unattended, remote monitoring outdoors. The DustTrak desktop models come with USB (device and host), Ethernet, and analog and alarm outputs allowing remote access to data. User adjustable alarm setpoints for instantaneous or 15-minute short-term excursion limit (STEL) are also available on desktop models. The alarm output with user-defined setpoint alerts you when upset or changing conditions occur. 8530	Includes: Carrying case, Rechargeable 7800 mAH Li-Ion Battery, Switching Power Supply with Universal plugs, TrakPro Data Analysis Software CD, zero filter, USB (device and host) computer cables, analog/alarm output connector, inlet cap (2), 37-mm cassette with mesh filter, 10-mm nylon Door-Oliver Cyclone, impactor kit (with PM1, PM2.5, PM4, PM10 impactors), impactor plates (2) and impactor oil (5 ml), sample extension tube (3-ft/1-m), sheath air HEPA filters (4), filter removal tool, operation <(>&<)> service manual, calibration certificate and 2-year warranty. 8532	Includes: Carrying case, Rechargeable 3600 mAH Li-Ion Battery, Switching Power Supply with Universal plugs, TrakPro Data Analysis Software CD, zero filter, USB (device and host) computer cables, inlet cap (2), 10-mm nylon Dorr-Oliver Cyclone, impactor kit (with PM1, PM2.5, PM4, PM10 impactors, impactor plates (2), and impactor oil (5 ml), sample extension tube (3-ft/1-m), sheath air HEPA filters (8), filter removal tool, screwdriver, operation & service manual, calibration certificate and 2-year warranty. 8533	Includes: Carrying case, Rechargeable 7800 mAH Li-Ion Battery, Switching Power Supply with Universal Plugs, TrakPro Data Analysis Software CD, zero filter, USB (device and host) computer cables, analog/alarm output connector, inlet cap (2), 37-mm cassette with mesh filter, calibration impactor kit (with PM2.5 impactor, impactor plates (2) and impactor oil), sample extension tube (3-ft/1-m), sheath air HEPA filters (4), filter removal tool, operation & service manual, calibration certificate and 2-year warranty. 8534	Includes: Carrying case, Rechargeable 3600 mAH Li-Ion Battery, Switching Power Supply with Universal Plugs, TrakPro Data Analysis Software CD, zero filter, USB (device and host) computer cables, inlet cap (2), calibration impactor kit (with PM2.5 impactor, impactor plates (2), and impactor oil), screwdriver, sample extension tube (3-ft/1-m), sheath air HEPA filters (8), filter removal tool, operation & service manual, calibration certificate and 2-year warranty. 801666	Internal Filter Kit, DustTrak II and DRX Handheld Models; 8 filters per package. 801667	Impactor kit, DustTrak II (only) Models 8530/8531/8532. Includes: PM1, PM2.5, PM4, PM10 Impactor Inlets, Impactor Bottom, Impaction Plates (Qty 2), Impactor Oil (5 ml). 801671	Standard Calibration Kit for DustTrak DRX Models 8533/8534. Includes PM2.5 Impactor, Impactor Plate (Qty 2), Impactor Oil (5 mn). 801685	External Battery Charger for 6600 or 7800 mAh batteries (both 801680) used in Desktop Models 8530/8533. Batteries NOT included. 801686	External Battery Charger for 3600 mAh battery (801681) used in Handheld models 8532/8534. Batteries NOT included. 801692	AC Adaptor / Power Supply to power the instrument and charge batteries inside the instrument. Use for DustTrak II/DRX Desktop Models 8530/8531/8532, OPS Model 3330, and AeroTrak Desktop OPCs. 801694	AC Adapter / Power Supply to power instrument and charge batteries inside the instrument. Use for DustTrak II/DRX Handheld Models 8532/8534, and AeroTrak 9306V OPCs. 801675	DustTrak II/DRX Complete Replacement External Pump Kit. Fully assembled external pump module, ready for connecton to DustTrak EP Model. 801795	DustTrak II/DRX External Pump Service Kit, includes: (x2) HEPA Filters; (x2) O-rings for Colder Connectors; and (x1) O-ring for Exhaust Adapter. 801799	DustTrak External Pump Replacement Kit. Includes: replacement pump and instructions for installing the new pump inside the External Pump module.